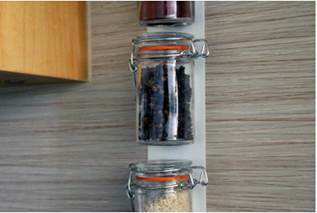 A spice rack is a kitchen essential… And it’s really easy to make your own with VELCRO® Brand fasteners! Read on to learn how to make a DIY spice rack that sticks onto the inside of your cupboard door – a convenient place for when you’re ready to cook and perfectly hidden for a clutter-free kitchen! Start by taking your lovely spices and labelling each one. You can do this by making labels to stick on each jar or by writing the name of the spice directly on the jar. Next, pick the perfect spot in your kitchen to display your spice rack. It’s important that it’s within easy reach when you’re cooking but your spice rack doesn’t need to be on display all the time. We’d recommend putting it on the inside of a cupboard door that’s relatively near the cooker but this spice rack idea works for walls too. 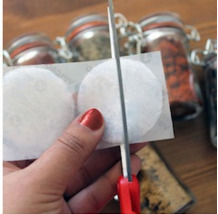 When you’ve chosen a spot, take your spice jars and stick one half of a VELCRO® Brand Stick On Coin to each one (trim it to size if you need to). Then stick the other side of the coin to wherever you want to stick your spice rack. The layout is totally up to you so do whatever suits your kitchen. We’d go for rows or columns (and if you’re going for columns, you could use VELCRO® Brand tape on the cupboard door/wall instead of coins). Then last but not least, stick your spice jars to the VELCRO® Brand coins on the wall. Voilà! A quick and easy spice rack ready to add a kick to your cuisine. Bon appetit!